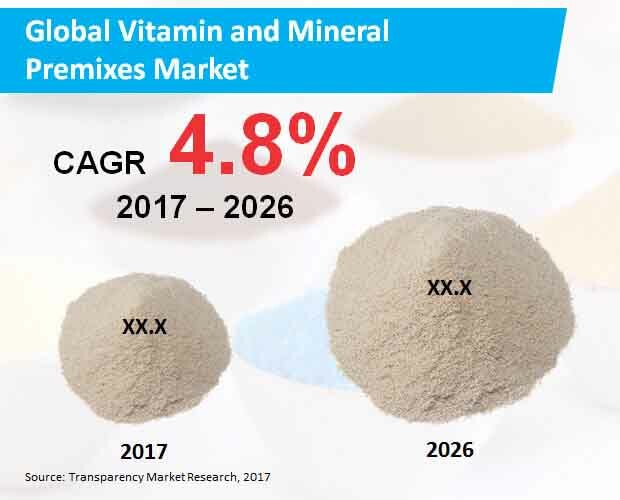 The vitamin and mineral prefixes market is a dynamic one to be sure because of continued product launches and strategic acquisitions and partnerships. Take for example Catalyst, a leading manufacturer of specialty products, vitamin and mineral premixes, and microbial blends. It has invested a whopping US$1bn to upgrade its facilities. Apart from that, another prominent chemical company such BASF SE has also entered into a partnership with Vital Therapeutics Pvt. Ltd. to build better products for the feed industry. Companies with substantial presence in the market for vitamin and mineral prefixes are Fenchem Biotek Limited, B&H Biotechnology Co. Ltd., Nutreco, Prinova Group LLC, Watson Inc., Hexagon Nutrition Pvt. Ltd., Glanbia Plc., Jubilant Life Sciences, Archer Daniels Midland Company, and Koninklijke DSM N.V.
A report on the market for vitamins and mineral prefixes by Transparency Market Research finds that it would rise at 4.8% CAGR over the course of the forecast period starting from 2017 and ending in 2026. The market was valued at nearly US$700 mn in 2017. By end of 2026, vitamin and mineral premixes worth more than US$1 bn is expected to be sold in the market. Currently, vitamin and mineral premixes in the powdered form are seeing maximum uptake in the market. By 2026, sales of the powdered vitamin and mineral premixes is expected to rise to US$800 mn by 2026. From a geographical standpoint, North America accounts for a dominant position in the market because of its large food and beverage industry, particularly centered in the U.S. and Canada. By end of 2026, its market’s value would reach US$400 mn. The animal feed industry is also a major driver of vitamin and mineral premixes demand. This is because of the rising adoption of pets among individuals and increasing number of farm animals across geographies. The burgeoning pharmaceutical industry too is majorly fuelling demand for vitamin and mineral premixes that help in repairing cellular damages, healing wounds, and boosting the immune system.